ACER was a shop which proposed some electronic equipments. The speakers describes in the document has been designed by G.A. Briggs for 24cm Wharfedale loudspeaker. We also can put on it Supravox loudspeaker as T245 or others. Schématic from Eurelec of the radio AEG Carina. schematic. Contact me if you don't find these documents on the Internet. Schematic from Eurelec of the radio Allocchio Bracchini - mod. 2011. Schematic from Eurelec of the radio Allocchio Bracchini - mod. 2012. Schematic from Eurelec of the radio Allocchio Bracchini - mod. 2020. Catalog Audax 90-6 : Charateristics of the speakers PR38S100, HD33S66, HD30P45 TSMC, HIF30HSMC, MHD24S66USM, HIF24JSM2 CA12, MHD21P37RSM, MHD21B37R, HIF20JSMSPK, PR17R37TSM, MHD17HR37RSM, MHD17B25R2CP12, MHD17P25JSM2CA12, HIF13J2CA12, MHD12P25FSM, HD13D37R, HD13D34H, PR130P20HR, HD12 x 9D25, HD100D25, HD11 x 10D25 SP, TW8B. Speakers enclosure :PRO38 crossover FP38, PRO33 crossover FP33, PRO24 crossover FP24, K3-60 crossover FK3-60, K3-50 crossover FK3-50, K2-50 crossover FK2-50, K2-40 crossover FK2-40, K2-30 crossover FK2-30, K2-25 crossover FK2-25, KTRI70 crossover FKTRI70. This catalog is a donation of a Tahitian surfer, French Polynesia. Doc n° 801: Principles, calculus and realisation methods for speakers. Audax technical document number 801, november 1962. You can find informations about following loudspeaker: T19PA12, T21PA12, T24PA12, WRF15, T16-24 PA12, T21-32 PA12, T21-32 PA15 (in French). Doc n°984: General recommendation for bass reflex construction and speaker specifications for T17PRA12, T17PRA15, T19PA12, T19PA15, T21PA12, T21PA15, T21PRA12, T21PRA15, T24PA12, T24PA15, WFR15, WFR12, WFR24, HIF13E, T30PA16, F30PA12, TA34A, T16-24 PA12, T21-32 PA12, T21-32 PA15, TW5G, TW6G, TW6BI, TW9G, TW9BI, TW8B, TW80. Also, You can find the documentation for Audimax 1 à 5 loud speaker (in French). Characteristic of some Audax Speakers and kits : 5CISB, 6CISB, 7CISB, 8CISC, 9CISC, BT9G, 10CISB, CAR11EB, F11PA16, FER11EB, AM12G, FER12G, BT12BI, FER17G, DEC17B, DEC17BP, FER16EB, INV19B, DEC20BP, SON20BF, DEC21B, WFR15S, WFR24, 7x13CISC, 7x18CISD, 8x12CISC, FER10x15G, FER10x16G, FER10x18G, FER12x19G, FER12x19EB, DEC12x19B, FER15x21E, DEC15x21B, FER7x2EB, T16-24PA12, T16-24PA15, T21-32PA15, T21-23PA15, SON21x32E, HIF87BSM, HIF8B, HD11P25F, HD11P25J, HIF11FSM, HIF11JSM, WFR12, HIF12B, HIF12EB, HIF13F, HIF13J, HIF13H, HIF13EB, HIF13B25J, HIF13B25H, HIF17F, HIF17H, HIF17JS, HIF17HS, HD17B25J, HD17B25H, HD17B37R, HD20P34HM, HD20B25J, HD20B25H, HIF20FSM, HIF20JSM, HIF20HSM, HIF21F, HIF21H, HIF21B37R, HIF24FC, HIF24H, HIF24HS, HIF24JSM-C, HIF24FSM-C, HD24S45-C, HD24S34H-C, HIF30HSMC, HD33S66, HD35S66, HD38S100, HD21.32S45, HD30P45TSM-C, MHD10P25FSM, MHD12P25FSM, MHD12P25FSM-SQ, MHD17B25J, MHD17B25R, MHD17B37R, MHD17B37T, MHD17HR37TSM, MHD17HR37RSM, MHD21B37R, MHD21B25J, MHD21B25R, MHD21P25FSM, MHD21P25JSM, MHD21P37JSM, MHD24P25FSM, MHD24P25JSM, MHD24P25RSM, MHD24P37RSM, MHD24P37TSM, MHD24P45TSM, MHD24P66USM, HD13D34E, HD13D34H, HD13D37, HD88D19MK, HD94D25MK, HD9x8D25, HD12.9D25, HD100D25, TW8B, TW85BI, TW54GM, TW65BIM, TW9.7BI, TW10E, TW800, 19PA15, 21PA12, 21PA15, 24PA12, 24PA15, SON28A, SON30HGuitare, PR33S100, PR38S100. Kits: KIT31, KIT41, KIT51, KIT101, KITBEX, K.4-150, K.3-90, K.3-60, K.3-50, K.2-50, K.2-40, K.2-30, K.Z-25. Audimax 220, Sonosphère SP12, Satellite/1. Schematic from Eurelec of the radio Autovox RT 51. Schematic from Eurelec of the radio Autovox Transmobil 2 mod. TR222. The AY8500 has been designed in the1970s (if I remember) to make a tennis game on the television (two rackets, a square ball...). The downloadable document contains the component application schematic a some assembly advices (pdf). Size : 700ko. Bang & Olufsen Beolab 5000 power amplifier schematic (jpeg). Size: 470 ko. User manual of the BECKMAN T100 et T110. Schematic from Eurelec of the Blaupunkt autoradio mod. Westerland. The schematic of the Bouyer ST75 60W power amplifier with vacuum tubes (jpg). Size 220ko. From the book "amplification BF" written by R. Besson. Seer here. Schematic from Eurelec of the radio Braun Taschenempfänger T4. 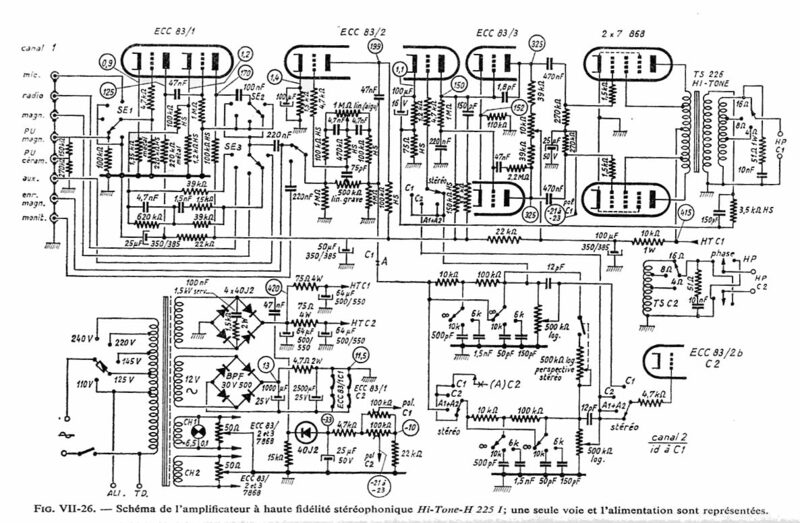 Schematic from Eurelec of the radio Braun Taschenempfänger T31. Schematic from Eurelec of the radio Braun Transistor K.
Characteriscs of some BST speakers (1982): DMT100, DMT500, HT351, HT371S, KSN1016A, KSN1005A, KSN1036A, PF5M, PF605M, DM195, PF403, PF85, PF81, PF100, PF120, PF1250, PF155. Filters : 25B, 45C, NW55, 75C. Characteriscs of some CELESTION speakers (1982) : G815, G1020, G1060, G1250, G1250TC, G1265, G1280, G12100, G12100TC, G12125, G15100PE, G15100TC, G18200, G18200CE, G18250, PCEL12-150, PCEL15-250, DC50, DC100, HF20, MH1000, TWINMH1000, HORN1, HORN2. User manual and downloading of PCCAM. This software proposes a framework to dialog with the smartcards. It is partly trasnlated in Globish. GeigerPC is an application for the Geiger Muller Counter PC-GM2 (in French), PC-GM3, PC-GM4, PC-GM5 et PC-GM6. Software downloading for the Geiger Muller counter PC-GM2. Software downloading for the Geiger Muller counters PC-GM3/4. Software downloading for the Geiger Muller counters PC-GM5/6. VCF <-> Contact Conversion (single VCF in multiple VCF, multiple VCF in single VCF...). Software downloading (in French). Schematic from Eurelec of the radio Continental mod. TR100. Schematic from Eurelec of the radio Continental mod. TR208. Schematic from Eurelec of the radio Crown mod. 666. Schematic from Eurelec of the radio Crown mod. TR820. 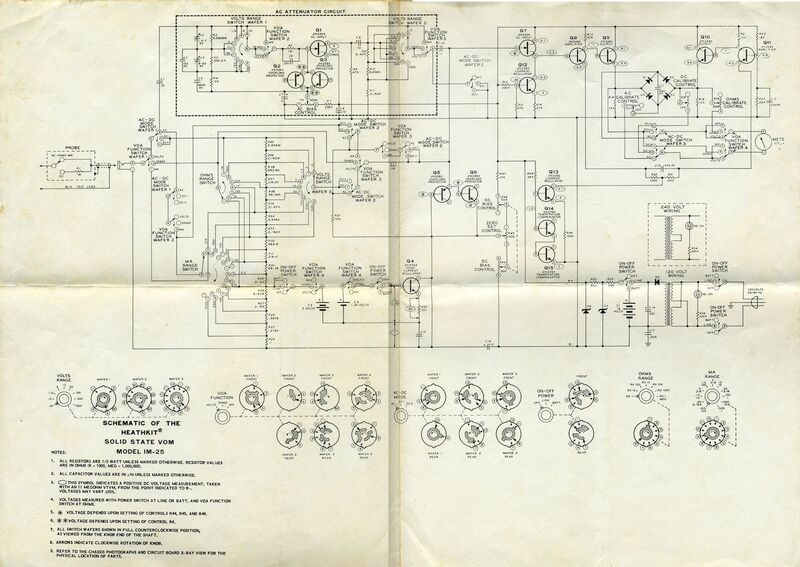 Stereo system SS730 Service manual. Contact me. 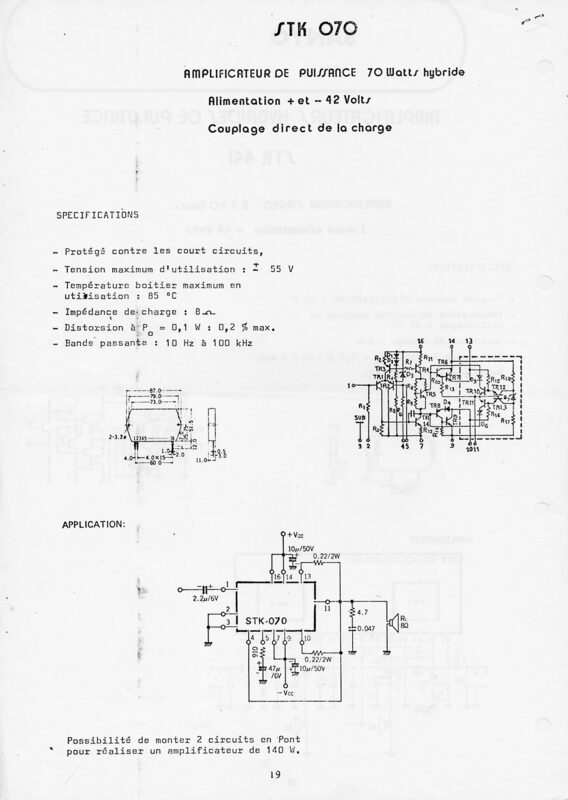 Ducretet L956 service manual with electronic parts, alignment procedure and schematic (.pdf). 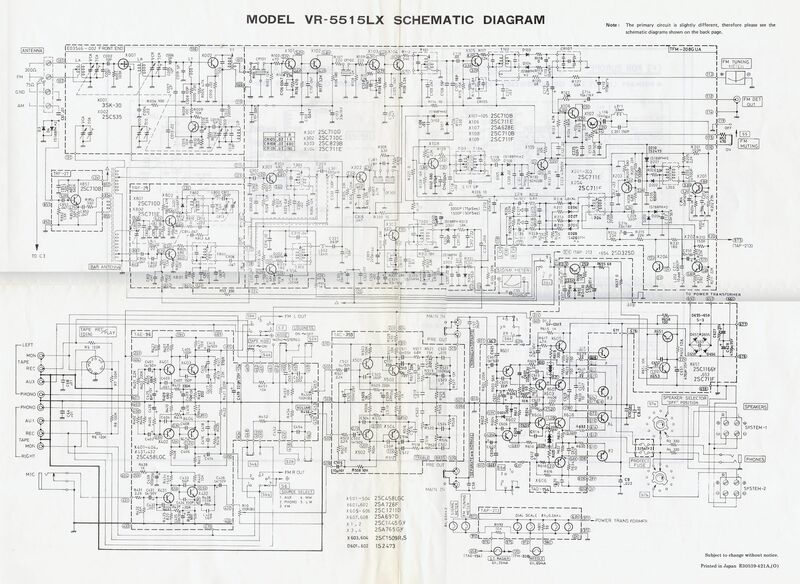 The schematic itself is not easy to read. I redrew the schematic for my own need when I was reparing my own DucretetL956. It is available in four parts (.emf). Informations about vacuum tubes. Very good overview. Elektor 1984. Size: 1Mo (in French). 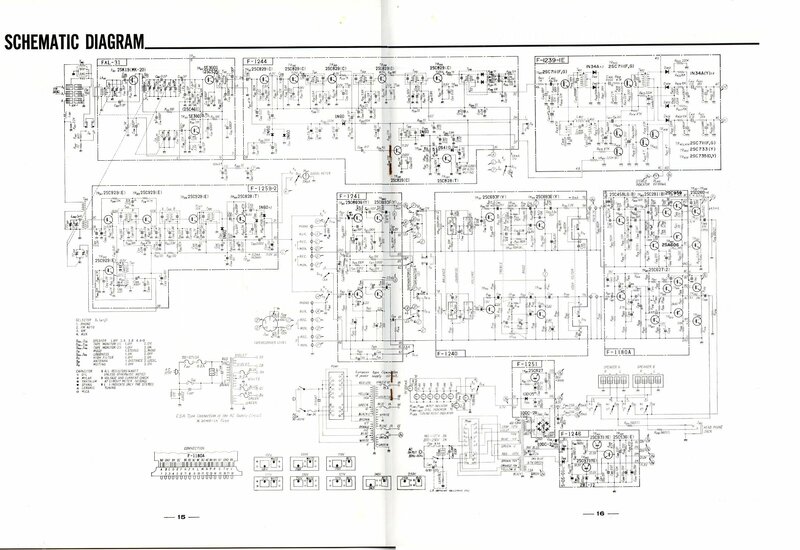 Some "infocards" from the Elektor magazine about power supply, integrated references of old integrated circuits, etc. (in French). This low cost power supply is able to provide 0 to 30V (or more depending of the main transformer. Maximum 70V). The maximum current depend of the ballast transistors (typically, 1 to 2A). A link to a page where you'll find the schematics, the courses and advertising from EURELEC company. EURELEC proposed correspondence courses from 1950s to 1970s (in French). 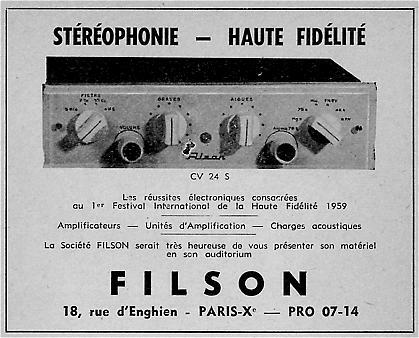 The FM tuner ESART said "Le Caisson" (The Box) was one of the best FM tuner in the years 1960-1970. Someone sent me this diagram which seems correspond. Speakers 12V726, 12V726DB, AUDIOM 12VX, AUDIOM 15VX, 10V516J, 10K516J, 10K617, 10K515, TC90Tdx, TC120tdx, TN46, 4V211, TC90K KEVLAR, TC120K KEVLAR, TC90Td TIOXID, TC120Td TIOXID, 5K413S, 5K013L, 5N411L, 4N412DBL, 4K211, 5N313, 5V323, 5K023, 6V415, 6K412L, 7V014DBL, 7K011DBL, 5V412DBL, 6V013, 6V011DBL, 6K011DBL, 7V313, AUDIOM 7K, 8V012DB, 8K011DB, 7V013, 7N515, 7V412, 7K415. Schematic from Eurelec of the radio Graetz Joker 834. 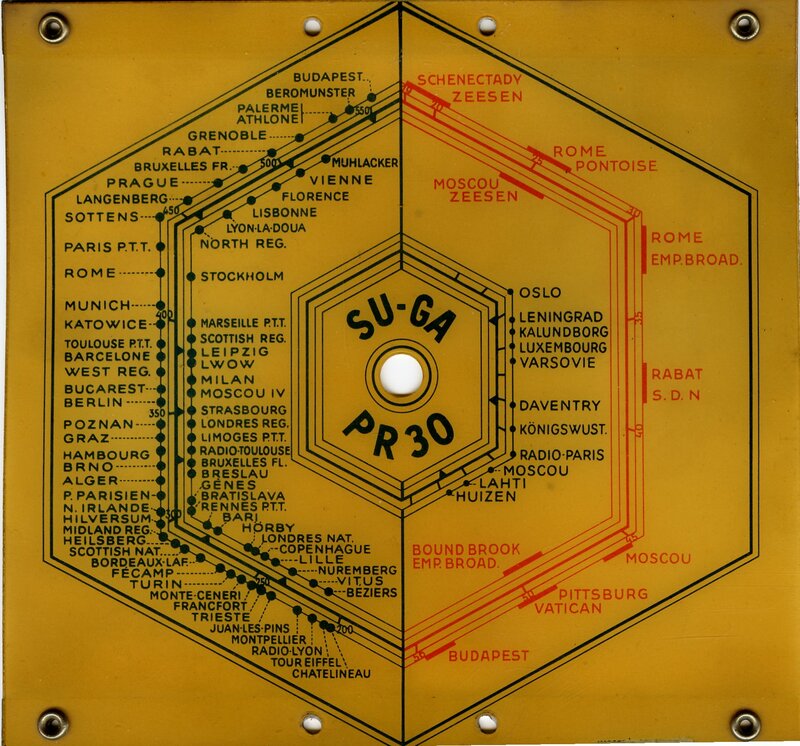 Schematic from Eurelec of the radio Graetz Susi 830. Grundig Satellit 2400 schematic and user manual. Grundig Satellit 2400 radio-set schematic and user manual (image jpeg). Size: 5Mo. The famous "Les secrets de la radio et de la télévision dévoilés aux débutants" from the "Le Haut Parleur" magazine. They are here some documents (n° 1252...1270) dedicated to speakers. Scanned with the advertising of that time (Renaudot, B.G. Ménager, Infra, Filtrocal, Garrard, Self-radio...). In french. schematic of the electronic volmeter IM25. IT12 User manual and schematic. 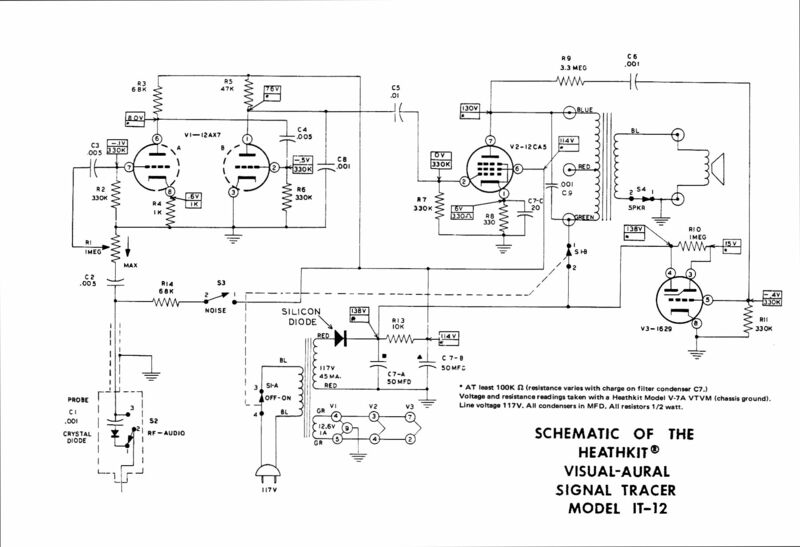 The User manual (pdf, 2.3Mo) and schematic (jpg) of Heathkit IT12 Signal Tracer. 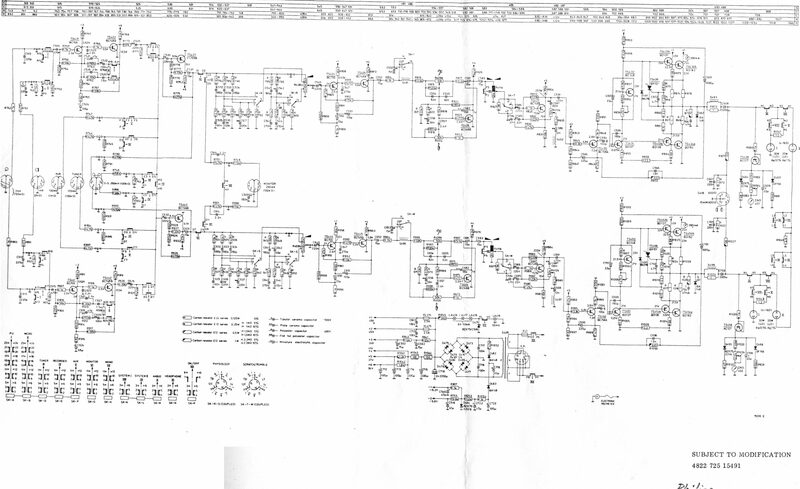 The schematic of the Heathkit Grip-Dip GD1A proposed in the EURELEC courses. The schematic of the Heathkit electronic voltmeter V5 proposed in the EURELEC courses. The schematic of the Heathkit electronic voltmeter AV1 proposed in the EURELEC courses. Characteristics of some HECO speakers (1982): TC305, TC256, TC246, TC206, TC136, KMC 52-6, KMC 38-6, KHC 25-6, KHC 19-6, HN 744, HN 743, HN 742. The schematic of the Hi-Fi Hi-Tone H225 power amplifier with vacuum tube. 2x30W, 0,1% distorsion. From the book "amplification BF" written by R. Besson. See here. Characteristics of some ITT speakers (1982): Quelques caractéristiques de haut-parleurs ITT (1982, catalogue Cibot) : LPH57, LPH77S, LPKH70, LPKMH25, LPKH75, LPM101C, LPM131, LPKM37S, LPKM50FF, LPM140C, LPT100, LPT130S, LPT170FG, LPT180FS, LPT201FS, LPT200, LPT210FSC, LPT246FS, LPT260FS, LPT300, LPT270FC, LPT330FS, LPT370FC, LPT280P, LPBH128. The schematic of the JACKSON TV-G1 generator proposed in the EURELEC courses. The initial schematic comes from http://web.tiscali.it/audiofanatic3/Schemi/Tipo/Valvole/finali/Schemi_PP.html. It has few mistakes and does not describe the power supply. The schematic which can be downloaded here corrects the mistakes and describes the power supply which is a little bit... unusual (jpg). Taille 240ko. 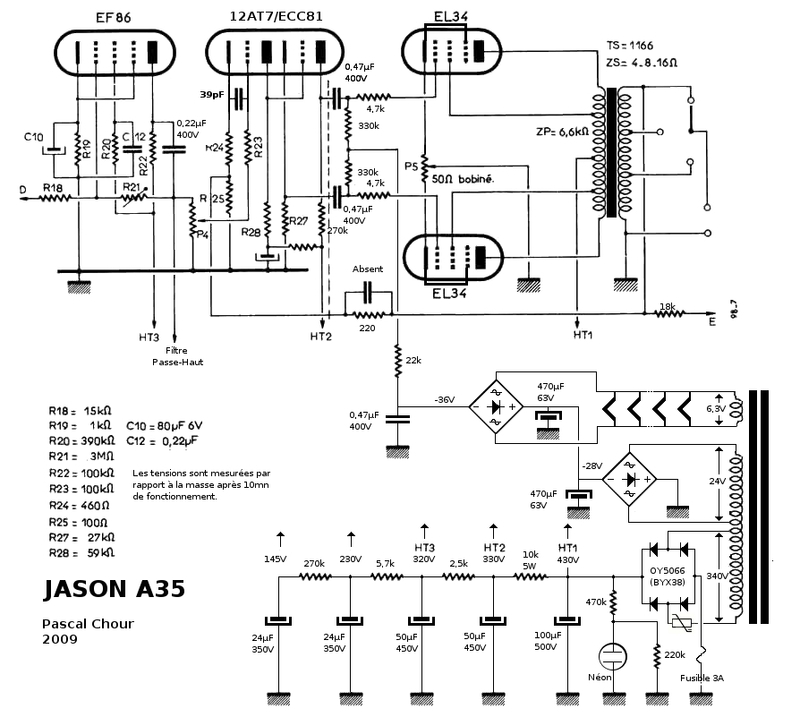 JVC VR5515LX AM-FM receiver and power amplifier: user manual (French, English, German) in html, schematic (jpg, size:1,2Mo) and power supply (pdf, size:175ko). Schematic from Eurelec of the radio Loewe Opta Dandy. Schematic from Eurelec of the radio Loewe Opta Dolly. Schematic from Eurelec of the radio Loewe Opta Lissy. Schematic from Eurelec of the radio Loewe Opta Lord 4930. Schematic from Eurelec of the radio Loewe Opta Lord 5930. Service manual of the hybrid power amplifier LV105. Very close of the LV103. L48 A Lampemetre User manual (html) and measurement protocol. Size: 250ko (in French). Power amplifier class A/AB PM80 service manual. Don't confuse with the PM80MKII. Oscilloscope METRIX OX170 user manual and service manual. Many thanks to Jean-Noël / F1PNH for the contribution (pdf, 1,2Mo and 900ko). Someone send me some documents about the French speakers Morgane Etude IV, manufactured in the 1980s. You'll find the datasheet and an extract of the magazine "Revue du Son" of december 1985. Schematic of the OK138 signal-tracer (Office du Kit) without the mistakes of the orginal schematic. A signal injector is also available. AT3507V power amplifier schematic (pdf, 800ko) and user manual (pdf, 2,5Mo) AT3507V that you can see on this web site. 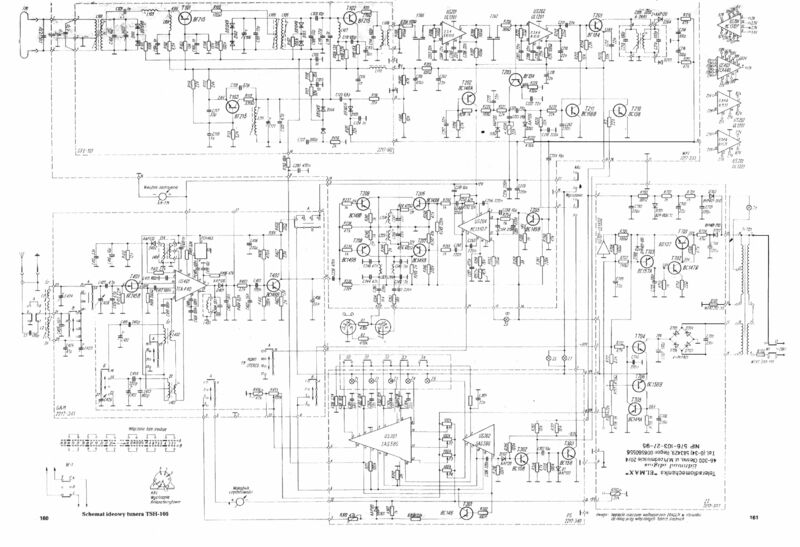 T3411 Tuner schematic (jpg, 1,2Mo) that you can see on this web site. The orginal schematic can be download at http://www.elektroda.pl/. (you must be registred). The one that I put for downloading here was re-worked in order to be more usable. Perlor Radio lampemetre user manual and schematic (abstract from the original user manual). The schematic of Philips RH 521 power amplifier (jpg). Size: 900ko. TV PRS01474 T-04 629 CM8852 / CM8832 (pdf, 3,5Mo). User manual and service manual of the Philips PM 6667 and 6668 frequency counter. Many thanks to Jean-Noël / F1PNH for the contribution. Schematic from Eurelec for the radio Philips L0X90T. Schematic from Eurelec for the radio Philips L0X95T. Schematic from Eurelec for the radio Philips L1D90T. Schematic from Eurelec for the radio Philips L1X75T. Schematic from Eurelec for the radio Philips L2X97T. 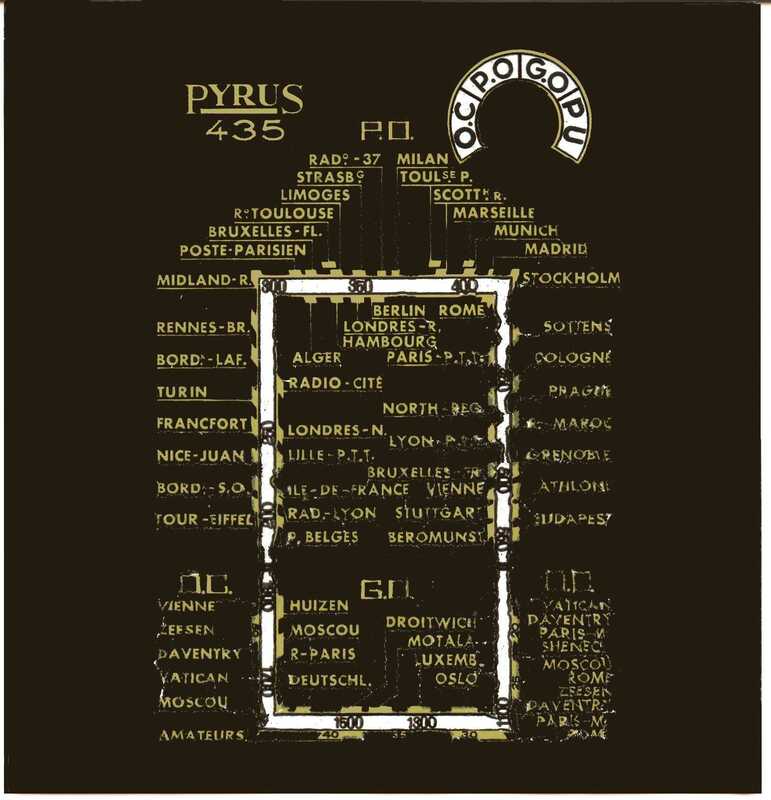 Schematic from Eurelec for the radio Philips L3D00T. Schematic from Eurelec for the radio Philips L3X71T. Pioneer SA900 user manual. There is also the part list and the place of the components on the PCBs. Service Manual for the Model 520. Contact me if you don't find that document on the Internet. 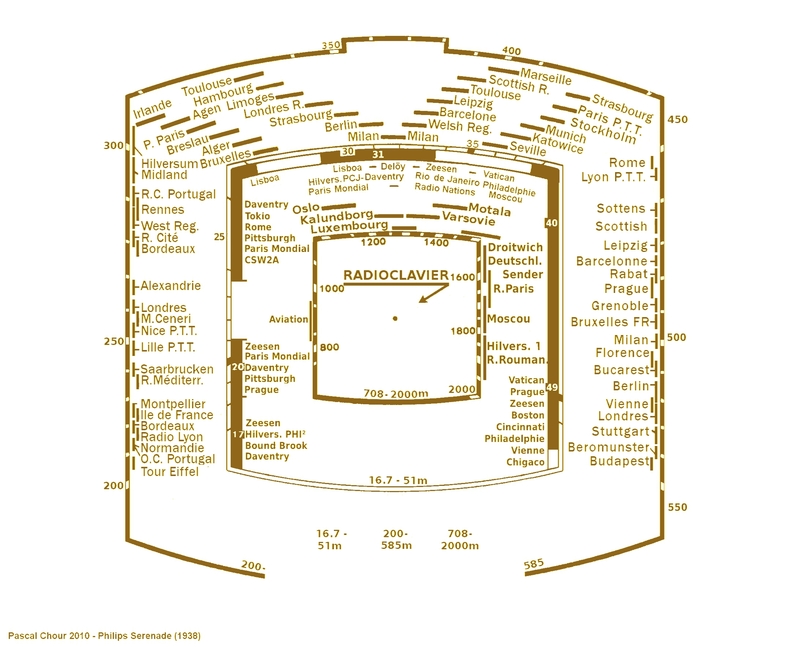 Radio Plan, Page 1, Cirque-Radio, Table of contents, RadioSet R107, RadioSet FUG10. A special edition of Radio-plan magazine at the end of 1950s devoted to surplus transceivers. 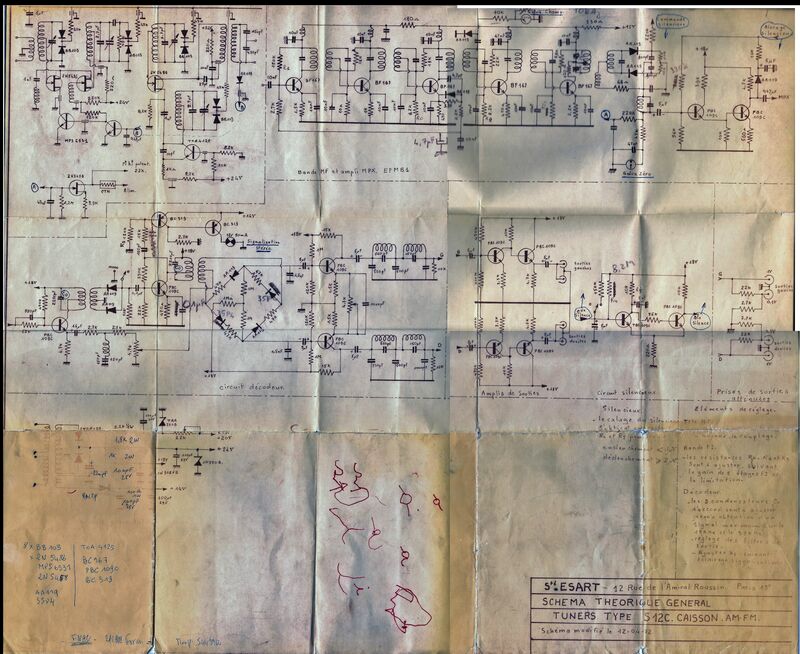 For those who are interested, you can find schematics, explanations, eventually, modifications for BC453, 454, 455, APR4, UKW, BC728, EZ6, R61 ou RR3, BC499, CR100, RM45, R107 (p92 à 96), BC475 et 191, BC1206, BC348, BC224, BC312, WS58, WS19, FUG10 (p144 à 147) radios... an a lot of other practical informations. Page 3 = contents (in french). Given by Bernard Vivinis. 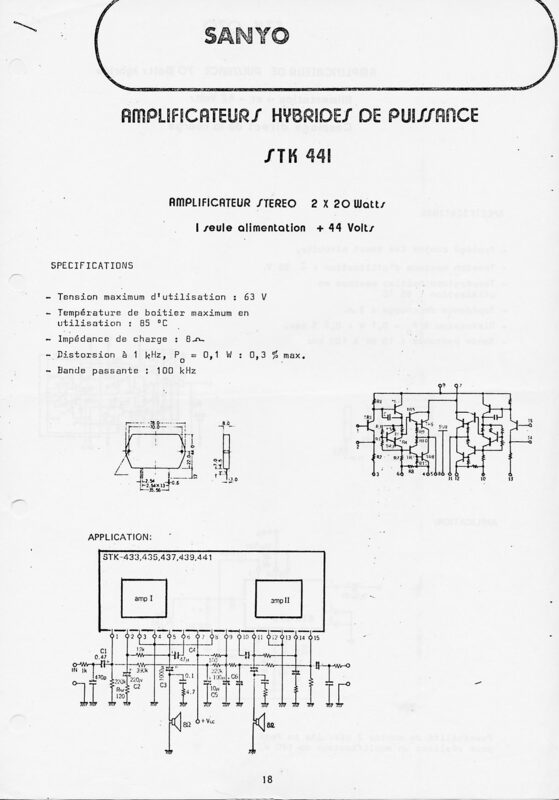 RX402 (power amplifier and tuner) user manual (French and German) and schematic. 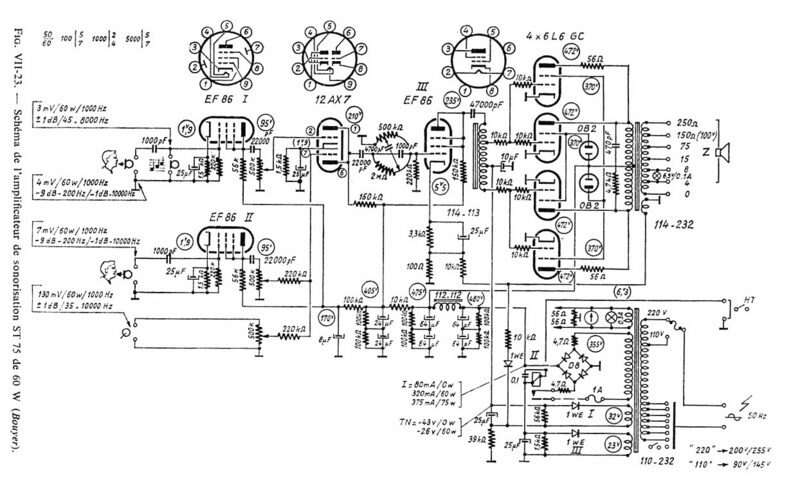 Sansui 100X power amplifier/tuner schematic. Service manual part 1 and part 2. 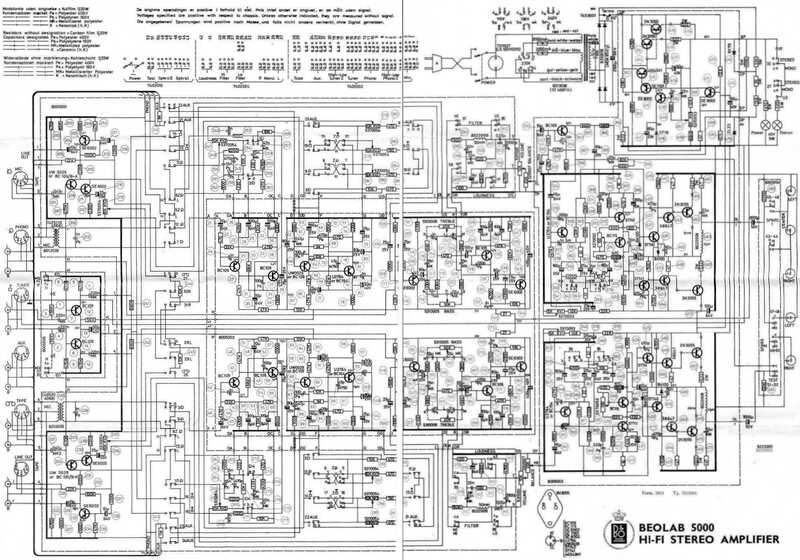 Sansui 1000X power amplifier schematic (about 600ko). Part1 and part 2 contain the other pages of the Service Manual (components list, tuning, dismantling, printed circuit...). Size: 3Mo. 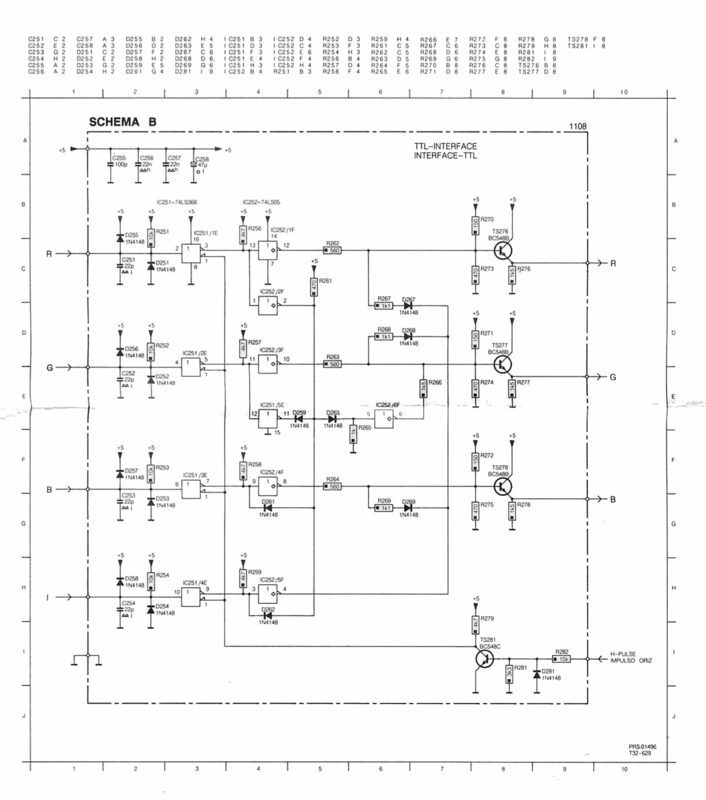 schematic for power amplifier with STK441 (jpg), STK070 (jpg), STK016 (pdf). schematics for the 2xChannels oscilloscopes Schlumberger 5013 and 5023 (in French and English). Size: 1,4Mo. Loud speakers references, filters schematics, schematic speakers. The references available are: 31TE, 31SPCT, 28SPCS, 25SPCM, 25SPCG3, 205SPCG3, 21CPR3, 21CPG3, 21CP, 17CP, 12CP, 19TSP, 17MSP, 13RSP, 12MC, 10MC, TWZ, TWM2, TWM, TWS, TWO, TW95E, 6TW85, 6TWD, SP31, SP25, P21, F240, F30, F40, F400, F600, F60B, F1000, DELTA200, GALAXIE200. The Davis company has been created by an ex from Siare and proposes some close loud speakers. In French. Enclosure schematics for Siare speakers: Système 1500, Système 1200, Système 1000, Système 800, Système MK80-31, Système MK80-28, Système MK80-22, Système 1002, Système 502. In French. The schematic of the SIMPSON electronic voltmeter model 303 proposed in the EURELEC courses. User Manual in French, English and Espanol of the ICF-25/25L receiver. Service Manual and User Manual of the Subwoofer SA-WM40. Characterisics of some SUPRAVOX speakers (1982): T175S, T215, T215RTF, T285, T245, T215RTF64, T245HF64, T285HF64. Mots of these loud-speakers are still built. See the Supravox Web Site for more details. 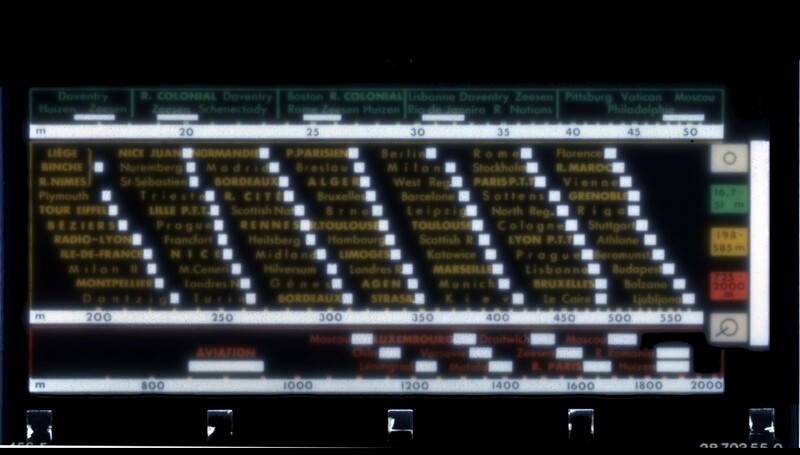 Came too early (1976), 16-bit processor TI 9900 has not succeeded in its place. At the time of the 8 bits processor, it was too expensive. In the first 16 bits of the time, he was too old. Yet it was a nice processor and the first 16 bits monochip. Datasheet of TMS4116 memory. When I searched this datasheet on the web, I came across bad scan. As this component is still widely used in 2015 (16KBit! ), it will always serve somebody. Aisberg was the director of the magazine "Toute la radio". You'll find here the first publication (given by Patrick Guivy). Codes list and user manual for the remote control Uniline 5 in 1 (in French). Ducretet-Thomson L124 radio-set dial (doc). Evernice type 508 radio-set right dial ( jpeg). Evernice type 508 radio-set right right ( jpeg). Opus 9 radio-set. Dial in three parts. Given by a net surfer (Roland). The whole dial is 603 mm long and 122 mm height - Glass thickness is 3 mm. 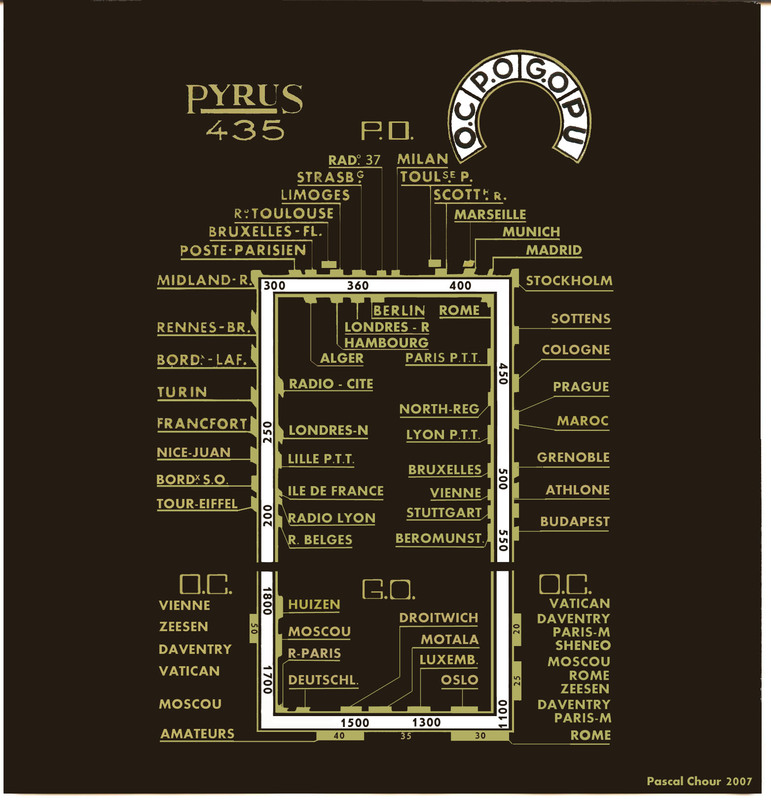 Pyrus 435 radio-set dial (jpeg). Width=130mm, Height = 135mm. Dial before repair. Philips Prelude 456A/20 radio-set dial (jpeg). Width = 90mm, Height = 108mm. Dial before repair. Philips Sérénade 555A radio-set dial (jpeg). Width =184mm, Height = 150mm. CDial before repair. SUGA PR30 radio-set dial (jpeg), 514ko. Measurement equipments for repairing and tuning. Company Bouchet located in Paris. Equipments designed according to the preconisations of Lucien Chretien. Universal multimeter type 470. Company located in Annecy. Universal multimeter type 311. Company located in Annecy. Radio-pupitre. Equipment for repairing with a lot of possibilities for the measurement. Company located in Paris. HF Generator, model 100D. Company located in Paris. Lampemetre build by the MB company. Company located in Paris. 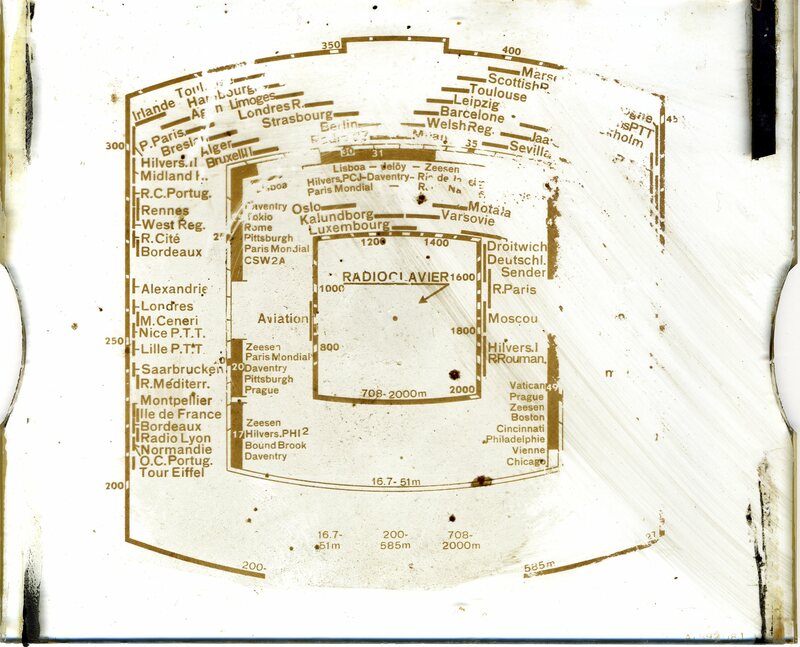 Philoscope type MS42. Measurement bridge. Universal lampemetre type Major. Company located in Lyon. Universal multimeter with double dial. Model Polytest. 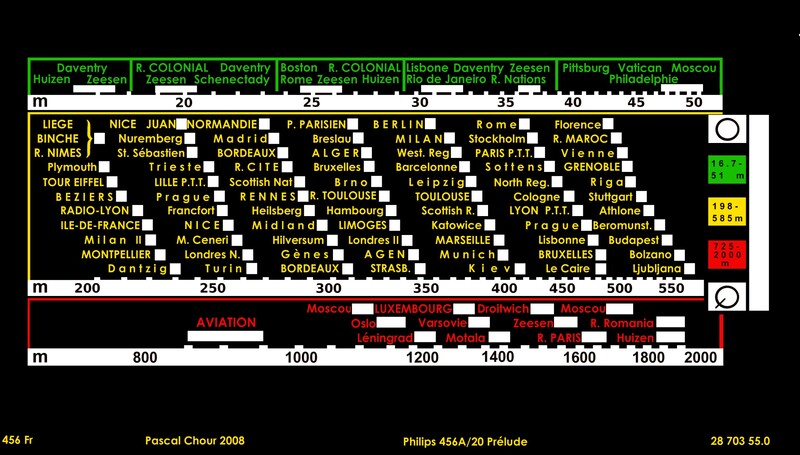 Heterodyn for alignement, model Master. Company located in Lyon. A lot of measurement equipment. Company located in Paris. Frequency modulator, model OM2. Comapny located in Paris. Electronic voltmeter, model C-43. Company located in Paris. "Ecole spéciale de TSF et de navigation aérienne" (Special School of radio and air traffic communication). Two addresses. One located in Paris, another in Nice. "Ecole centrale de TSF" (Central School of Radio). School located in Paris, De La Lune Street. Have a look about the advertising. It's moving due to the lyrism and the confidence in the future. Replace TSF by computer in the text, just for a laugh. If you work in the computer businesses, probably, you' will not laugh! "Ecole de Radioélectricité et de Télévision" (Radioelectricity and television school), 15 rue du docteur Bergonié, Limoges.